When Lucia discovers that Adrienne is planning to hit the road with her ex-boyfriend Richie, she figures Rena's her only way out of a life on the run with a mother she can't stand. But Richie has massacred a few members of the Brancaccio crime family for a big payday, and he drags even more trouble into the mix in the form of an unhinged enforcer named Crea. The stage is set for an explosion that will propel Rena, Wolfie, and Lucia down a strange path, each woman running from something and unsure what comes next. 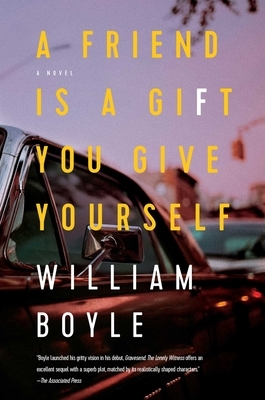 A Friend Is a Gift You Give Yourself is a screwball noir about finding friendship and family where you least expect it, in which William Boyle again draws readers into the familiar--and sometimes frightening--world in the shadows at the edges of New York's neighborhoods.